Goodness me. Are we nearly there yet? I have mostly been getting my kicks today through the growing (and visible) irritation of the HR person in the first employee rep meeting today as I asked her to carry out a number of perfectly reasonable and yet time-consuming tasks that she clearly didn't want to do. I actually do want the answers, but the fact that she clearly didn't want to have to go and find them gave me some pleasure in an otherwise very long 3 hour meeting. Anyway. To the business in hand. Where had we got to again? Ah yes, W. One of my favourite letters in the musical alphabet... for reasons that will become obvious below. Oh yes, and I suppose I should mention that this is not the alpha and the omega of my music collection. It's only a relatively small and probably unrepresentative view of where I am today, although I suppose it probably represented me at some point in my life.... or represents where I have been anyway. Shall we just get on with it then? Ah, right you are then. Frankly, who knew that a two-piece band like this could be either so popular or so good? The White Stripes seem to occupy a niche entirely of their own, although at their very heart is the Blues - a style of music that just never seems to go away. "Seven Nation Army" is probably mine (and everybody else's) favourite song and "Elephant" my favourite album, but there's so much other stuff to love here too. They're fantastic live too, and let's not forget that "Fell In Love With a Girl" was the first dance at my wedding, after all. Great band. The Ws are off to a brilliant start. Surely it's downhill from here? Ah, the godlike genius of Noel Scott Engel. I've probably rambled on here about Scott Walker enough for one lifetime already, but suffice it to say that, alongside Morrissey, he has been a towering presence in my record collection. His honeyed baritone has always been present, of course, right from his earliest days with the Walker Brothers, performing songs like "The Sun Ain't Gonna Shine Anymore" and "Make It Easy on Yourself", but where he really comes into his own is with his solo work. How many other artists have reacted to achieving boyband like levels of success by singing increasingly bleak songs about existentialism and death? Certainly not Ronan Keating, anyway. To understand how far away he was from his bandmates in the Walker brothers, you only have to listen to their last album, "Nite Flights". The first four songs are by Walker and are a clear signpost of the direction that he has subsequently taken. They are extraordinary songs, if indeed "songs" is the right word for them as they bear very little resemblance to traditional song structures at all.... but when the four songs are over, track five starts with a terrible lurch into something horribly conventional by one of Walker's "brothers" in the band. A man more out of place you could not wish to hear. Remarkable stuff. If you are interested in Walker, and you haven't already seen it, then I strongly advise you to watch Scott Walker: 30 Century Man. It's interesting enough as a run through of Walker's career, but where it really comes into his own is in the footage of Walker as he was making "The Drift". Here is a man who is dancing to the beat of his own drummer and is paying little or no heed to conventions or the normal pressures of the music business. There's one beautiful anecdote in the film where the head of his record label comes in to the studio to listen to a playback of "Tilt" - Walker's 1995 record, and his first in 11 years. It's an intense record, and it was being played back at full volume over a pair of massive speakers. After a couple of songs, the executive turned to the producer and asked him if he minded playing it through the smaller speakers. The producer obliged, but just as the music started up again, much more quietly, Walker appears behind the executive and says something like, "Would you mind terribly if we listened to it through the big speakers? When I've created something, I only listen to it once and then never want to hear it again. If it's all the same to you, I'd rather remember it through the big speakers". The executive obviously complied, awed in the presence of one of the last remaining true auteurs. He's a man who has followed his muse wherever it has taken him, and I for one am richer as a result. Oh, what else is there to say about our Amy that hasn't already been said? Well, all I will say is that whatever the issues she might have in her life, there is ample evidence on these two albums that she is a fantastic talent. Adele and Duffy might be coming up on the rails, but they've both still got some way to go before they come anywhere near Winehouse. The Jam were a brilliant, vital band. How come Weller turned into everything he hated when he was that young firebrand? This is a reasonable album, I suppose, but I can't listen to it without thinking about the preening peacock Weller has become, all opinions and well-cut clothing and hair. I just can't be doing with him, frankly. Most notable for the blatant steals Elastica made here for their album... but a seminal punk album in its own right, of course. When did I last listen to it in full? Er. 1996? Christ, I really should give it a spin, eh? Ah, Wolfsbane. Probably notable mainly for providing the world with Blaze Bayley, the man who would go on to replace Bruce Dickinson (briefly) in Iron Maiden and last seen advertising hair replacement therapy. For me though, he will always be the frontman of Wolfsbane, a band that I absolutely adored in the early 1990s - to the extent that I joined their fanclub. Yes, I was a Howling Mad Shithead. Kathy Wilson was a mini-album that they released in 1990, and although it's only about 20 minutes long and the production values are pretty poor, it's an absolute corker. The title track is inspired by a long-forgotten 1950s alien invasion style B-Movie and it's fantastic. I still love it today... and I'm sure Des would back me up here too. Classic, innit? Well, classic artist anyway, if not exactly a classic album. I've got "Hard Again" on cassette somewhere actually. You listen to the version of "Mannish Boy" on there. Now that's the blues people. The Who are one of those bands who I like, but have never really had the energy or the inclination to trawl my way through their vast back catalogue. Ergo a Greatest Hits. "Substitute" remains an absolute cast-iron classic though. I can take or leave Pete Townshend though: he's always struck me as a bit of a knob. It was "Buddy Holly" first, of course, with its classic Spike Jonze video, but several years later - and a bit after the event - I discovered their other stuff. They're kind of the foundation stone of the sound of some of those emo bands aren't they? Only without the eye-liner and stuff. Good band. Lots of guitars. Angsty. What's not to like? I'm not even sure why I even bought this in the first place. 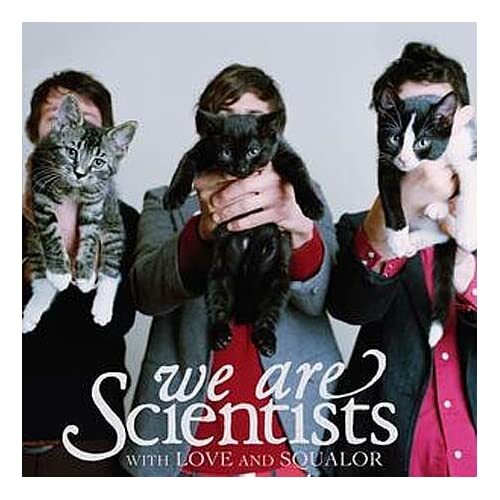 I think perhaps it was the album cover of the band holding cats (including the very cute one that looks at though butter wouldn't melt in its mouth but you can't help but notice that by the time we get to the inside cover, the guy holding it is wearing gloves). Almost by accident then, I discovered an absolutely fantastic album. Songs like "Nobody Move, Nobody Gets Hurt", "This Scene Is Dead" and "It's a Hit" are superb songs. They're also extremely good live, coming onstage to "Against All Odds" and picking up their instruments and starting to play the Phil Collins classic themselves... and the encore consisted of the band doing "End of the Road" in a acappella stylee. Nice. They've got a new album out this month actually, and if the new single "After Hours" is anything to go by, it's looking good. I was due to see them at Rock City next month, but sadly I've double-booked and will be in Oxford watching James instead... so if you know anyone who wants a ticket...? Oh, it's so tempting to be rude here just to annoy those fans who think that our Rufus is the greatest thing since sliced bread.... you know who you are. I think he's alright. He's a little too stagey and theatrical and I occasionally find his voice unbearably reedy (his version of "Hallelujah" is alright, but it's not a patch on the Jeff Buckley version, is it?). He is clearly talented though: the two "Want" albums are fantastic of course, and although I can't say that I care for it as much, "Release the Stars" has its moments too. He's also a great live act, and I've seen him do two very entertaining sets at Glastonbury (such an unlikely venue for an artist like this, don't you think? ), but also a brilliant set at the Royal Concert Hall in Nottingham. He's certainly not everybody's cup of tea, and he doesn't strike me as natural and unforced a talent as his sister, but when he's good, he's very, very good. Why haven't you filed Weller with the Jam like you do with other solo artists? Dead right about Paul Weller. I don't like him either. Never have done. Even in his earlier "group" days. Nowadays he's trying his best to copy Eric Clapton. Has anybody told him not to bother? that bit about Blaze Bayley's hair ads was hilarious, thanks for the link!